This weekend, the Met Opera gave it’s last performance of what became the hot button cultural event of the season here in New York, John Adam‘s 1991 Death of Klinghoffer. Death of Klinghoffer premiere at La Monnaie, 1991, photo by Baus Hermann J. The opera is about the the 1985 hijacking of the Achille Lauro cruise ship by four members of the Palestinian Liberation Front, during which a 69 year old Jewish American passenger was murdered. As you might imagine, controversy has dogged the work since it’s premiere at La Monnaie, in Belgium, just six years after the original events. That being said, the reception in New York seemed especially strong compared to other recent productions in the US. Having seen the piece myself last week, I thought I’d offer a few thoughts on its merits. Musically, the opera is known for its choral pieces, which are mostly quite lovely/striking, ranging from peacefully meditative to distressingly aggressive. Besides the choral music though, I found the music pretty flat at the beginning. The second part had more diverse music though, from agressive expressions of anger to one weirdly 90s commercial jingle interlude… All in all though, that diversity I thought included stronger music and made for a more interesting musical experience. All that said, I don’t think the opera is antisemitic or glorifies terrorism, two critiques often thrown at it. It obviously depicts hatred, and I think that’s done heart-wrenchingly well. While Palestinians are given a voice in the choruses, and allowed to express their grievances as displaced people, the terrorists aren’t really sympathetic. But that comes to another critique, about humanizing the terrorists… And of course, they are indeed human, not pure avatars of evil, so I think that aspect was pulled off alright… Despite some glimpses of underlying shared humanity, their actions are never sugarcoated. Now for some totally inappropriate emotional whiplash! Tonight’s the season premiere of Bellini‘s La Sonnambula at the Met Opera, and it’ll be live-streamed starting at 7:30. The illustration at left, by American painter and muralist William de Leftwich Dodge, shows the climactic moment when the protagonist, Amina, sleep walks atop a rickety old mill bridge, very dramatic. Anyway, lots of lovely music in the opera, so enjoy the live-stream! 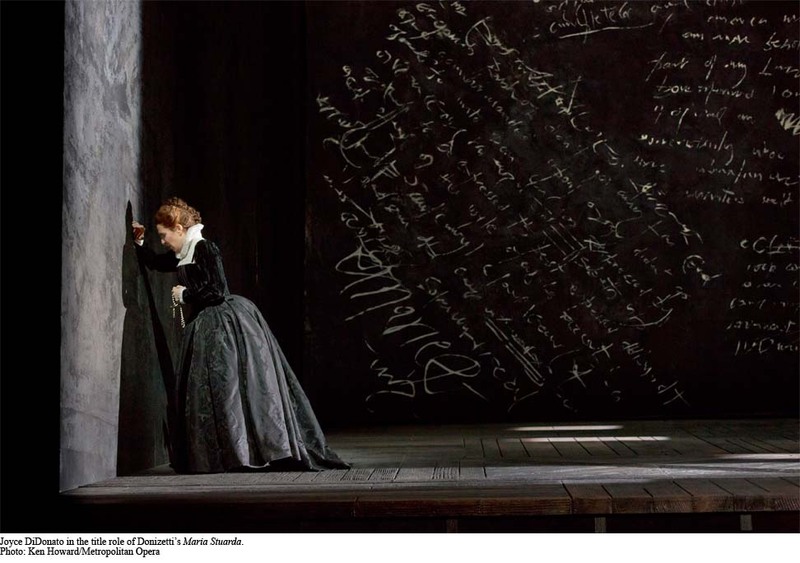 PBS‘ Great Performances series will be airing the Met Opera premiere of Donizetti‘s 1835 opera Maria Stuarda on Sunday (check your local schedule). An overlooked opera for sure, but a widely praised performance, especially from Joyce DiDonato in the title role. When she’s not watching non-stop Catholic mass on TV, my grandmother sometimes watches the news from Spain, which is how I learned that today is Catalan soprano Montserrat Caballé‘s 80th birthday! To celebrate, here is probably her single most famous performance, in Bellini‘s Norma at the 1974 Orange Opera Festival. Additionally, here’s an interview with her in 1970, where she discusses the role of Norma four years before that legendary performance (Part 2 here). The second half of NYC Opera‘s current season is fast approaching, and I’m seeing their posters everywhere lately, even my local pizza shop! So here’s a preview of the video projections designed by Beehive studio for Michael Count‘s production of Rossini‘s 1818 opera Mosè in Egitto. Rossini’s Moses in Egypt – Trailer from Beehive.tv on Vimeo. So get yer’ tickets, for Mosè in Egitto and Offenbach’s La Perichole! Right now you can get 10% off tickets for both operas with Promo Code 10678 when buying tickets online!